While CVOTER predicted that overall, voters are happy with the BJP government, it also said that NDA may not make it big in Kerala, which has always been a far away dream. 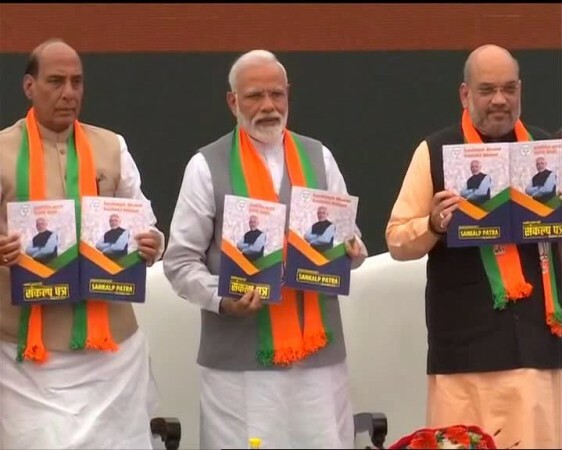 Prime Minister Narendra Modi, BJP president Amit Shah and Union minister Rajnath Singh released BJP's manifesto ahead of the upcoming Lok Sabha polls. Around half of the voters continue to be very satisfied with the performance of Prime Minister Narendra Modi, according to a CVOTER-IANS survey. Over 12,000 voters were interviewed by the CVOTER poll tracker. the survey suggested that 50.95 per cent or exactly half of the sample were happy with Prime Minister Modi's governance. Another 22.49 per cent said they were satisfied to some extent. There were 25.29 per cent voters who said they were not happy with him at all. The satisfaction level with the Prime Minister remained high mostly after the air strikes on the terror camp in Pakistan's Balakot whose momentum on the voters has sustained despite a slight dip. The latest findings of the tracker poll came just three days ahead of the first phase of polling on April 11. While CVOTER predicted that overall, voters are happy with the BJP government, it also said that NDA may not make it big in Kerala, which has always been a far away dream. On the other hand, the UPA government may win in the southern state. the predictions have come after Congress President Rahul Gandhi announced that he will be contesting from Wayanad in Kerala. This is the first time that the president of the national party is contesting from a southern state.